Tel Aviv has developed into a world-leading city, the capital of big ideas that creates new thrilling horizons; a hub of the Israeli Start-up economy and the home of Tel Aviv University (TAU). In 60 years, TAU has become a leading university, ranking among the world’s best. TAU offers everything you admire about Tel Aviv and Israel: forward-looking, open to the world, pluralistic, ingenuous, brave and bold. TAU harnesses Tel Aviv’s energy and creative chutzpah. The result: its students and faculty pursue out-of-the box thinking in all disciplines. No wonder TAU is #1 choice among Israeli students and employers, and its Graduates rank 8th in the world for founding successful companies! Established in 2000, TAU’s Center for Nanoscience and Nanotechnology is a pioneering force in Israel’s nanotechnology revolution, and has not only become Israel’s “Chief Nano R&D Centre”, but one of the most important in the field at-large. As a multidisciplinary research center, its scientists are committed to advancing society by engaging in close and sustainable cooperation with industry and society. To-date, TAU’s Nanoscience and Technology division comprises 90 research teams that have published more than 1,700 scientific papers, registered 200 patents, and provided advanced services to industrial affiliates. A new, dedicated building for the Nano Center will soon be constructed. This building will galvanize TAU’s nano research community, reinforce multidisciplinary research and technological innovation, intensify industry collaboration and create new connections between the scientific world and society at large. Specifically, the JNF Canada Floor ( 2nd Floor) will be home to seven laboratories and seven offices. A woman of action and a tireless advocate on behalf of countless worthy causes, Judge Barbara Seal C.M. is widely admired and appreciated for her illustrious career in public and community spheres. Our honouree has been widely recognized for her many outstanding contributions in helping to make our country a more harmonious place. In recognition of championing Canadian unity—particularly among the youth— Ms. Seal has received the Order of Canada, nation’s highest civilian honour. A past Vice-President in charge of the Canada Day Celebrations for Québec, Ms. Seal holds the distinction of having been selected as one of 125 Canadian volunteers to receive the Governor General’s Special Edition Plaque. Ms. Seal has also been awarded the Commemorative Medal for the 125th Anniversary of Canadian Confederation and the Queen’s Golden Jubilee Medal. In appreciation for her devotion to community and intercultural rapprochement, Ms. Seal has received the Médaille des Arts et Métiers from the Carrefour des Communautés du Québec, the Golda Meir Award, Grande Dame of Montreal, the Jerusalem 3000 Medal, Canadian Parks and Recreational Association Award, and the Canadian Cancer Society Award. The immediate past National President of Canadian Friends of Tel Aviv University, Ms. Seal was bestowed an Honorary Doctorate and the President’s Medal in 2008. In 1997, our Honouree was appointed a Canadian Citizenship Judge and served in this capacity for more than a decade. Although retired, Judge Seal still enjoys conducting major citizenship ceremonies and relishes opportunities to visit schools and communities in the service of enhancing Canadian patriotism. As a Hampstead municipal councillor for 22 years, Ms. Seal was responsible for introducing innovative policies and programs, such as twinning the town with the northern Israeli municipality of Kiryat Shmonah and the annual “Hampstead Day”. 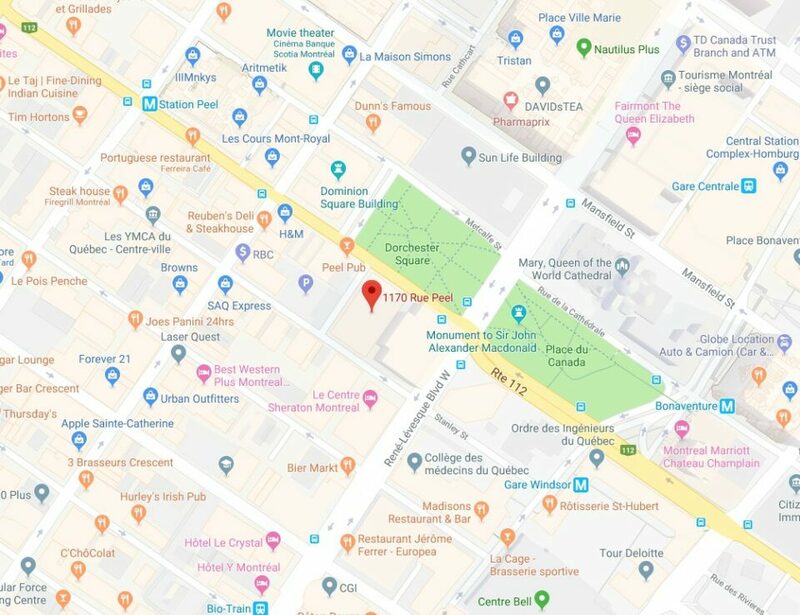 Ms. Seal is a past member of the Board of Directors of Place des Arts, the Arts Council of the Montreal Urban Community, Théâtre Espace Go and the National Forum on climate change. She presently sits on the Board of the National Arts Centre in Ottawa, the Segal Centre for Performing Arts, the Advisory Board at the McGill School of Continuing Studies, and is a Governor of Tel Aviv University. 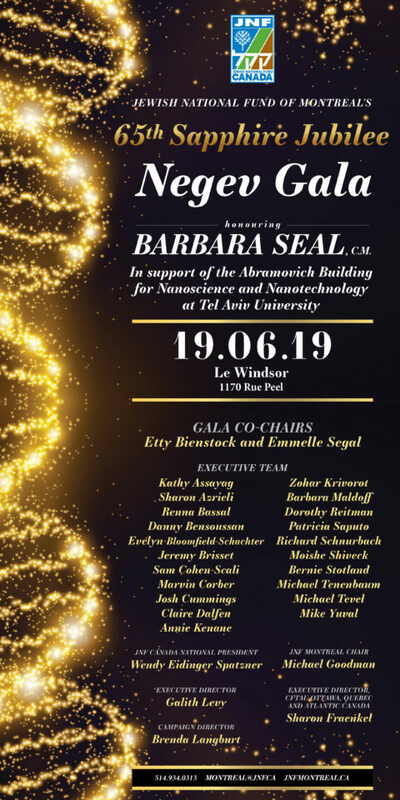 Drawing inspiration from the Jewish value of Tikkun Olam (“healing the world”), Ms. Seal endeavours to create a better world by partnering with JNF to support the cutting-edge medical science at Tel Aviv University.